“The objective of the Association is to serve the residents of the Cheswolde area by doing everything reasonable and proper for the preservation, betterment, development, and well-being of the Cheswolde community." The history of the Cheswolde area extends back to the 18th Century. 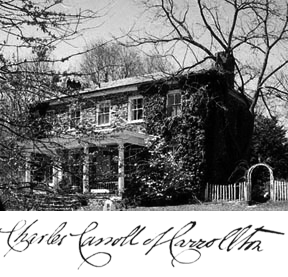 Land north of Western Run in the vicinity of Greenspring Avenue and Pimlico Road was owned at the turn of the 19th Century by Charles Carroll of Carrollton, a delegate to the Continental Congress and the first United States Senator for Maryland. He was the longest-lived (and last surviving) signer of the Declaration of Independence, dying at the age of 95. A house still stands at the northwest corner of Greenspring Avenue and Cross Country Boulevard, and is reputed to have been Charles Carroll's hunting lodge for his surrounding property. At approximately this location on the Western Run a grist mill operated for the first half of the 19th Century. Around mid-Century it was converted to a snuff mill, and operated as such until damaged by flood in 1868. The Pimlico Road dates from the 18th Century, but no record of early settlement along its Cheswolde portion exists. Green Spring Avenue was originally a construction project of a private turnpike company. Chartered in 1858 to build and operate a road from the present Green Spring Valley Road to the City, the company only worked sporadically at completing the project, and it is likely no tolls were ever collected. By 1867 the portion linking the present Cheswolde area to the City was complete but no settlement of consequence followed. By 1898 the Baltimore and Northern Electric Railway Line (later, United Railways, Inc.) crossed Pimlico Road north of Western Run. By 1915, acreage called Cheswolde Farms—southwest of Greenspring Avenue and between Western Run and the United Railways Line tracks—had been laid out and subdivided. Although annexed to Baltimore City in 1918, the Cheswolde area had, by 1940, experienced little further development. Only a scattering of single-family detached houses had been constructed in Cheswolde farms, and along Greenspring Avenue. As with other communities in Northwest Baltimore, much residential building in Cheswolde occurred between 1940 and 1960. Beginning in the late 1960's and continuing into the present, the property that constitutes the housing in Cheswolde is largely a mixture of single family detached homes and garden apartments. These are located mainly along Clarks Lane and Fallstaff Road, Western Run Drive, and South Green Meadow Parkway. Much of the remaining undeveloped land in Cheswolde lies in the Western Run floodplain. The old Curtis-Wright Airfield, in the northwestern corner of the Cheswolde community, has over the past 15 years been developed as townhouses, garden apartments and condominiums. This 250 acre land parcel was purchased by the Curtiss Wright Company in the late 1920's and operated by Curtiss Wright and later independently as an airfield and flight school into the 1950's. Bonnie View Drive to the east.